The contest is closed, congratulations to Caren! Thanks everyone for all your support. Look for a new give-away soon. any chance you would be doing an angel of some sort – I mean stain glass. Christine, I do actually have an angel in progress. i have been working on the drawing for a while. The skater took years of back and forth until I was happy with her-hopefully the angel design will come together a little faster! Thanks for letting me know – that’s great. I will not wait ‘with baited breath’ as a truly inspired masterpiece is not of one’s own timing if you know what I mean. At least I believe artist expression, along with basic raw talent, comes from the soul and is fed by the spirit, don’t you know. In the meantime, enjoy the journey and the wonderful process as I’m sure when it does come to full bloom, it’ll will be nothing short or awesome. Could you please include me in your draw. Wonderful prize!. I wish you continued success .. you are obviously propelled by your talent for great success. Christine, thank you for the lovely comments. I love to do trunk shows and share quilty experiences through talks and classes. Good luck in the draw! Thanks Dianne, you are in the draw! Glad you dropped by, are you our budding fibre artist? It was great meeting you in Almonte at Sue’s. I purchased two of your stained glass patterns and am looking forward to learning a new technique. Thanks for the advice that you gave me. Diana, I love meeting and talking with fellow quilters. have fun with the patterns! Great meeting you the other day. Your kits are so interesting and will be great looking in most decors. 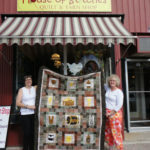 So nice to see them in one of our local quilt shops the Quilting Quarters in Almonte. We are so lucky that you are local and can talk with you, magazines are interesting and good to get new ideas from but it is great to able talk to the designer face to face and hear stories on how you get your inspirations. We are lucky. Keep up the great work! Nice meeting you too! I love to chat with fellow quilters and listen to their ideas. It’s also great fun to see their projects come along. Happy Quilting! I love your designs, some remind me of the group of seven type paintings. I would love to win your Artisan Spirit shimmer contest. Northcott fabrics being the only Canadian fabrics are a real favorite. Thank you Mary, you are in! I do love the Northcott fabrics-Stonehenge is awesome too. The fall group of patterns will be featuring new Stonehenge (drafts are in my blog). Thanks again. Hello Joni – I just discovered your patterns through Thimble and Things’ Newsletter. I will look forward to seeing your cottage country patterns at Sue’s store. And if, by chance, I won the ‘My Favorite Birch’ Kit, I would be delighted. I keeping thinking that I should plant a birch tree in memory of my father. The birch was his favorite tree. Piecing/quilting a birch tree would be a great alternative. Thank you Halina! The birch tree in the quilt sits in my front yard and has been through ice storms, pests and lots of other trials but still keeps on. It’s about 40 years old which is getting old for a birch so I made the design to show where it would like to be living in a nice pastoral setting! You are in the draw and I look forward to meeting you. I love your new pattern. Actually I like all your patterns. You have obviously found your niche. I noticed the above ad in an American Magazine – congratulations! Hi Joni, Having seen your beautiful quilts at Sues on Saturday I had to check out the website (love all the pictures of the quilts and your students too)and of course I would love to win one of the kits!! The new fabric line looks lovely and perfect for landscapes and stained glass which are two of the things I have enjoyed doing in the past and if I won a kit would love to get doing one again!! Congratulations on your latest endeavours and I am sure we will see lots more of your creations in the magazines and shows. I will suggest your name for a trunk show and talk about creating patterns to the Richmond guild as I am sure we would all enjoy hearing of your experiences!